So ours is a good look as a simple design that definitely keeps the up-keep pretty low. 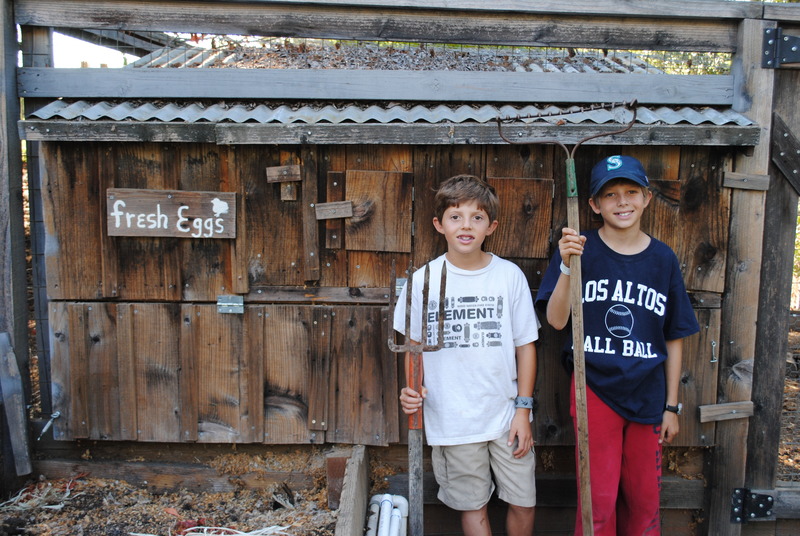 And, what’s neat too – is that all the wood used in the coop is recycled wood from a fence we took down. Well, our coop currently houses three chickens – . The chicken’s “house” as I call it – was built by me (the mom) and my three boys – Tyler (12), Andrew (11) and Will (8) – the outside “FORT KNOX” as my husband calls it – was built by him (as you can tell by the name – nothing is getting in there!). Anyway, the coop house was designed so you can almost get that grocery store experience… just open the door and you’ve got yourself some eggs! No need in my my to enter the coop unless you want to… We’ve got three little boxes, with three doors – so you can have anywhere from 1-9 hens and they can live comfortably here. We’ve also designed the size of the boxes according to the proper dimensions so… the chickens will lay the eggs in the boxes, but won’t poop in them (don’t want any of that now do we…). Inside the coop in a roosting bar strategically placed for easy of cleaning… if you don’t already know – chickens poop while sleeping and hanging out on the roosting bar. So we just open a door that goes right out to the compost pile. With one simple flick of the wrist out the poop goes – very easy. We’ve also got two doors so the coop essentially opens up for easy cleaning and has lot of ventilation to keep the chickens happy. The chickens can gather beneath the coop since it’s raised off the ground and we have a covered area for their food and an automatic waterer. Best of all, we don’t have to let our chickens in at night. We’ve designed (guess I should say my husband) designed Fort Knox so no animals can get into the entire coop area to hurt our chickies! So to see it – stop on by and we’ll give you the full details. 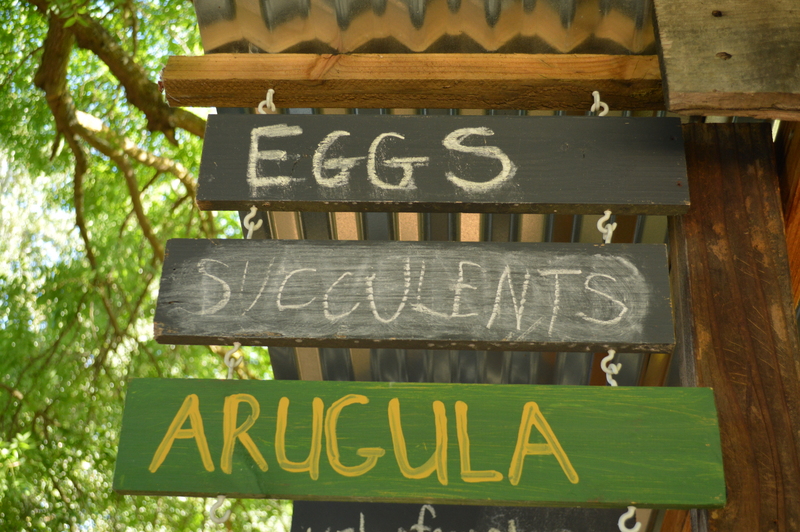 We’ve got a farm stand – just up and running. So there will be some goodies for sale by the youngins in our area! So you’ll be able to grab some lemonade and other treats! 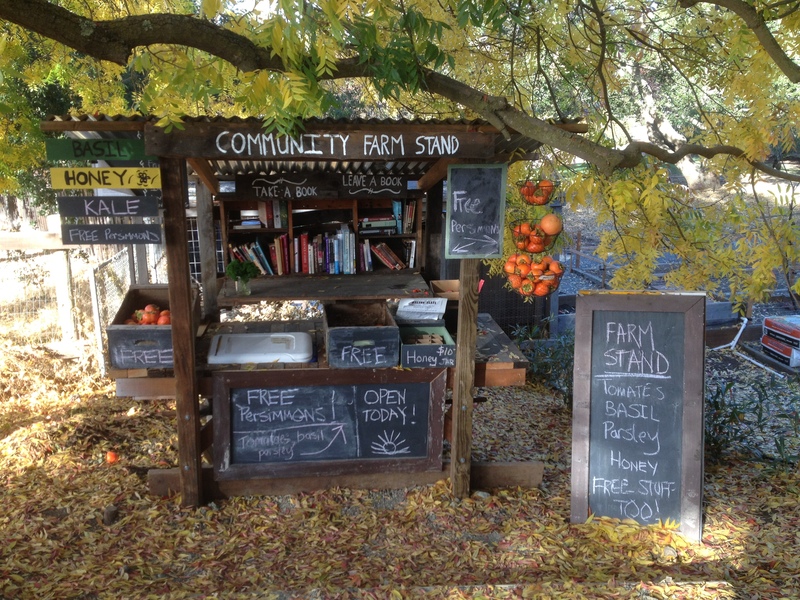 The farm stand includes a community sharing library.. take a book, leave a book. The farm stand will also provide a space for neighbors to put out extra produce to share with the community for free since the end of summer often brings a bounty of extra crops individual families just can’t consume!